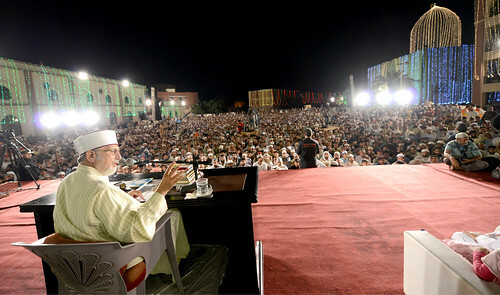 Dr Tahir-ul-Qadri made these remarks while addressing the thousands of participants of Itikaf City here at Township Lahore today. He said that evil is deeply embedded in human nature along with goodness. Allah Almighty has ordered His subjects to seek His pardon at several places in the Holy Quran and introduced Himself as the One Who accept others’ repentance. Allah says in Sura Al-Baqra, that He loves those who adopt piety and seek repentance. The MQI leader said that when Satan tricked Adam and Eve into eating the fruit of forbidden tree under the guise of an eternal blissful life in paradise, that is how mistakes made unintentionally came into being. At this, Allah not only taught words of penance to Adam and Eve but also accepted their pardon. He said that the Holy Quran has urged human beings to be firm and steadfast in their repentance at several places in the Holy Quran. He said that if we study the Holy Quran deeply with a view to understanding its text and implementing its teachings in our life, the meanings of His mercy will start dawning on us. Dr Qadri said had the mercy of Allah not enveloped the world, it would have exploded with His wrath a long time ago. Allah looks for ways to forgive His people. It is an example of pardon that He does not send his torment to a place where people seek forgiveness. It is a great blessing that after one seeks pardon, his/her sins are changed into good deeds. He further stated that the holy month of Ramadan should be spent in deep deliberation and efforts should be made to reform oneself with a firm mind.